A Man for All Seasonings: Time to get back to making (and eating) food! Time to get back to making (and eating) food! Like most families, ours shared a lot of good meals this past holiday season. Down in the New York area where we come from, Vicki and I made two large meals: one for 14 people and one for 12. This post is sort of a wrap-up of our holiday season. The first was a party to welcome our two latest additions to the family: Rena and our grandson Jackson to the annual festivities. That involved making a huge lasagna, containing ground beef, Italian sausage meat, three kinds of cheese (ricotta, mozzarella and parmesan), mushrooms, spinach, plus marinara and béchamel sauce. The real bummer is that there were no sources of fresh pasta near where we were staying, so we had to use that stuff with the rippled edges. Two days later, it was back to the kitchen for Christmas dinner. Much as we have gotten fed up with making the exact same meal for 41 years, it consisted of turkey with stuffing, vegetables, cranberry sauce and two pies plus cookies for dessert. Maybe next year we can talk people into something else. How about a nice roast beast with Yorkshire pudding? The past few years, we’ve been buying organic, pastured turkeys from Hemlock Hill Farm in Cortlandt, NY. They are a bit on the pricey side, but the extra money is very well-spent for such well-raised and butchered birds. Don’t tell my mother-in-law, but our big secret for cooking a succulent and flavorful turkey is to brine it. Believe me when I say that it makes all the difference. Done correctly, the whole bird is infused with the flavors of the herbs, fruits, and spices you put into the solution, and just the correct amount of salt. It’s also critical for any roast meat to rest for at least 15 minutes before carving so all those luscious juices sink back to the center instead of running out onto the cutting board. What must also be taken into account is that the temperature of the meat will go up 5-8 degrees (F) while it’s resting. We take our poultry out when the internal temp is 165° and it rises to about 171° after 20 minutes. That’s a little lower than “government recommended cooking times”, but if your bird is at 180° in the center, the outside – especially the white meat – will be overdone and dry. I also have a good trick for cooking your bird faster and juicier which I’ll be sharing with you all. The year’s 15-pound turkey (stuffed) took under 2 1/2 hours to reach the magic temperature. One recipe I haven’t changed for years is our orange cranberry sauce recipe. Making fresh sauce is simplicity itself and a job that can be done way in advance, so you’re not going nuts on the day. The flavor also improves as it sits, and that’s also a good thing. Vicki always makes the stuffing and everyone who tastes it for the first time (like Rena did – Jackson was sleeping at the time) comments on how extraordinary it tastes. Her secret is simple: lots of fresh herbs. 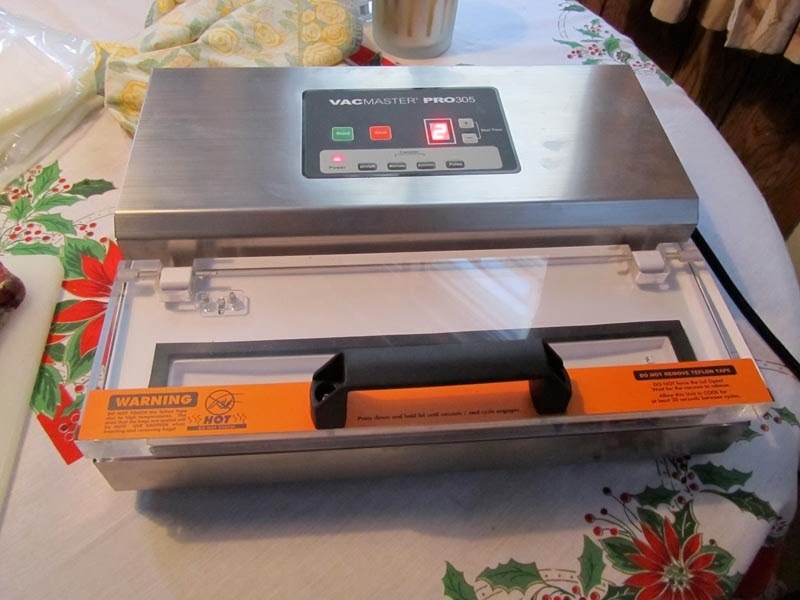 Our big gift this year was a semi-commercial vacuum sealer. These things are new since I worked in kitchens, but having bought lots of meat and cheese that have been packaged in them, I know how incredibly valuable they can be to people like us. I plan to do a review of it, but it’s too new and we haven’t used it enough yet. 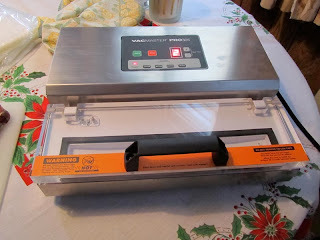 The reason for buying a more robust unit is because we’ll use it a lot – more than the Avantco slicer we were given last year (although I love that machine) – and I want to make sure it will do what we need over the long term. Stay tuned for that. Back on the curing front, we’re in the middle of curing five pounds of pork loin for our first batch of lonzino this curing season. I didn’t want to start it earlier because the drying process requires daily monitoring. Two of the three really critical things about making good lonzino are ensuring that it doesn’t dry too quickly (the outside gets hard and impenetrable so the inside doesn’t dry out enough) and of course you heading off any bad mold growth [Sidebar: white mold is good. Green or black mold, definitely not!] and take steps to get rid of it. Caught early, it’s not a problem. Just wipe it off with a rag dipped in white vinegar. If bad mold gets a few days’ foothold, though, you’re going to have to chuck your carefully crafted charcuterie. I may need to pick up some more beef bungs which are what I encase the pieces of lonzino in while they’re hanging. It works very well to aid in a slow, even drying that yields the best product. Expect a full report soon because I’ve tweaked the recipe yet again. So basically, there’s a lot to come over the next few months. Winter means soup around here, so expect some fantastic soup recipes. We’re experimenting with a linguine with white clam sauce that’s almost ready to share. And that’s just a peek at what’s planned. There will be lots of good eating around AMFAS before spring arrives. Stay tuned! Cold weather calls for comfort food! Are you doing your best when purchasing eggs?